The Conservatives were able to hand a very mild drubbing to their erstwhile MP Douglas Carswell in this week’s council by-elections. 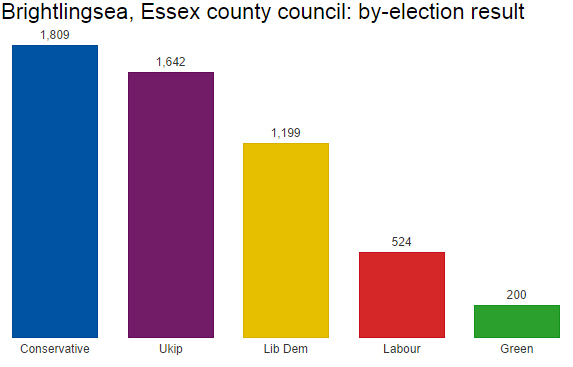 A seat on Essex county council was up for grabs after the resignation of Ukip’s Roger Lord – the man who was originally pencilled in as Ukip parliamentary candidate for Clacton before Carswell’s defection. There was a swing of 4.4% from Ukip to the Conservatives, who have a comfortable majority on the council. 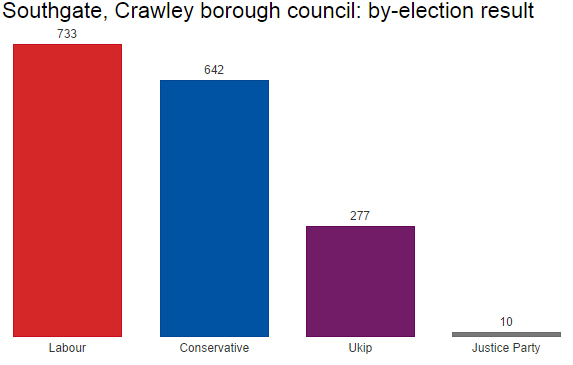 This was the first by-election for Crawley council in four years. Labour’s ruling majority on the council now stands at five. The other three by-elections on Thursday saw no seats change hands. The Tories held a seat in Blackpool, though both Ukip and Labour were close behind. The Tories also held a seat in Chelmsford, while Ukip held a seat in Rushmoor: some consolation for their two losses elsewhere in the country. The Press Association’s analysis of five comparable results suggests a 1.2% projected nationwide Labour lead over Tories. Their calculation based on four wards fought both times by all three major parliamentary parties gives a line-up of Labour 39.1%, Conservatives 38.8%, Liberal Democrats 7.0%.